The ankle holster has become something of a commodity product of late and the resulting fade into oblivion of anything resembling a top-quality ankle holster is all but complete. So, finding something that is more akin to a legacy ankle holster product on most mainstream shopping channels is a bit more difficult to do. The sea of generic foreign made holsters that trade at below $25 USD makes finding the best ankle holster something of a major task. All that said, there are still a few great holsters on the market; as well as there are some of the more generic marketplace items that are quite well built and those that simply offer good value despite being the very antithesis of a custom holster. By the way, we aren’t negative on the idea of an inexpensive, generic item that can do what other more expensive holsters can do, especially considering the lack of real estate on the lower calf and ankle. We just want to make sure that readers understand what they are getting, or the lack thereof, when they buy cheaper imported products instead of something that is more capable of performing the job. Below you will find a set of products that will generally be denoted as the best in class for the ankle holster market, and as ubiquitous as the ankle holster seems to have gotten, it is still a valuable asset for the concealed carrier. We aim to help those dedicated carriers to decide on the best ankle holster for their specific needs. Who uses an ankle holster? A lot of users will want to have something that is easily accessible to them for draw purposes, especially those who sit all day and need something comfortable. The ankle holster can be that holster for many users. The design favors smaller guns and thinner, lighter weight profiles, but even larger guns now can be carried on an ankle holster if running or other heavy movement isn’t in your immediate future. NOTE: no matter how much you read in the marketing materials from a given manufacturer of ankle holsters: ANKLE HOLSTERS ARE NOT FOR FREQUENT MOVERS OR RUNNERS. These are best suited to stationary people or light walking duty. With the proper accessories and the right socks, etc. these can be an all-day walking holster, but out of the box they are not suited for that type of work let alone active movement with any frequency. The ankle holster is among the most casual of holsters from a use case scenario. As a backup firearm, an ankle holster can be very effective. That said, you must know that ankle holsters are not the be all end all. While they offer a lot of concealability for those who don’t regularly wear skirts or skinny jeans, they are typically very minimalist accessories, that cannot support a lot of heavy use and weight. If you want something that can be worn with sportier clothing than a business suit, the ankle holster is a good choice. 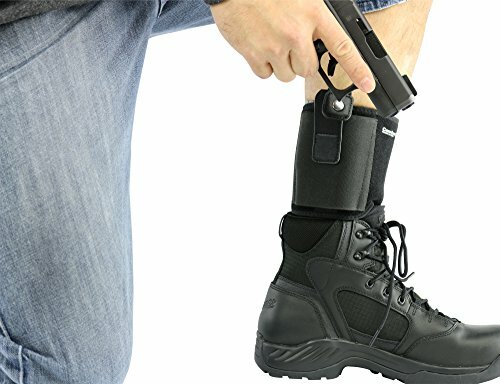 If you need something that will fit a variety of smaller guns, the ankle holster is a good choice. If you need a cheap carry option, generally the ankle holster is a good choice. If you are not able to wear a different style of holster because of prolonged sitting (and where you cannot use something like a shoulder holster rig), the ankle holster may be a good option. If you need the fastest reaction time for a sitting position, the ankle holster, in the right configuration can be the best draw option. Go generic or pay extra for a specific build? This is a personal choice, but generally speaking, the larger the gun the more custom you will have to go. Another consideration is movement – where you will need to know that enough pressure and enough build quality must exist for prolonged bouncing or hard running. The generic options aren’t bad, but they will also unravel quicker and offer less creature comforts, even if they might be slightly more comfortable to wear due to the one size fits all configurations, and material choices (typically light weight and form fitting). If you want to test the waters, go generic. If it works for you, stick with generic. If you have a specific use case that means you need a more specific build – go with the bigger names. If you want a holster that will last more than a couple of years stay away from the generics (note price is going to vary wildly – almost regardless of the build quality). Just because you don’t plan on using it often, it doesn’t mean you should skimp on an ankle holster, in fact it’s a glaring reinforcement of the idea of not skimping. You need to be able to count on your gear when you decide to pull out a gun from it. Make sure you brought enough holster. Because of the area it is in, you will experience a steep learning curve on getting to comfortable wear. 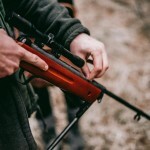 Concealed carry is an amazing thing for many people, but you must be careful about the ramifications of carrying and discharging a weapon that is not properly licensed and trained with. Concealed carry isn’t just about picking a great gun and finding a suitable holster: there are a lot of nuances that go into the grand scheme of the carry spectrum. It is illegal to carry in some locations, and comfortable ankle holsters with small guns can make it easy to forget you have a gun on, in banks, courthouses and schools, where there are legitimate legal requirements. Plan accordingly. Without further delay, here are our choices for the best ankle holster on the mainstream market. EXTREMELY COMFORTABLE - We use a neoprene band that is comfortable even when worn against your skin unlike elastic bands. A Foam pad behind the gun protects your ankle from pressure points. Fits most duty guns including G30S G19 G26 G27 G42 and G43. FITS WIDE RANGE OF GUNS - Our elastic holster fits a wide range of guns from micro pistols to subcompact, compact, and revolvers. Best for any gun with an overall length under 6.5" will fit including .22 LR, .380, 9mm, .40 S&W, .45 ACP, 10mm, .38 SPL, and .357. FAST SILENT DRAW - The retention strap features a metal snap for a fast and quiet draw in any situation. No Velcro to give away your position. Perfect piece of gear for police, military, or civilians. FLEXIBLE FIT - we offer two sizes, a 15" band that will fit up to a 13" leg and a 17" band that will fit up to a 15" leg. If you plan to carry over your boots be sure to get the 17" band. See images for measuring tips. Fits Springfield XD XDS Kimber Solo Ultra Sig Sauer P229 P290 P938 M&P Shield and more. MONEY BACK GUARANTEE - ComfortTac offers a 30 day buy and try money back guarantee. You can buy the Ultimate Ankle Holster and use it for up to 30 days. If you are not 100% satisfied simply return it for a refund. The ComfortTac ankle holster is a great example of a very good generic design. This is a specific company design, so the word generic doesn’t really fit, except that it’s very “universal”. In fact, “universal” is a great word to describe this holster. It’s well made for the money but it’s a little too universal to be a top choice for everyone. Maybe that’s its strong suit: it is above average for most even if it isn’t perfect for many. WHY IT IS RECOMMENDED: The universality of the ComfortTac ankle holster makes it a great do-it-all for small gun carriers who need a starting rig. The DeSantis Die Hard S&W Shield is a top-quality option for those who know they want leather for their gun, but want the comfort of neoprene and want a brand name attached to their ankle holster. WHY IT IS RECOMMENDED: DeSantis Die Hard S&W Shield is a specific build for a very good gun for the ankle carry crowd and it executes well on most fronts. ✔ Premium Velcro： Velcro After 1000 tests,still maintains a strong paste, and ankle holster ensures that your gun does not slide off your feet. ✔ Protecting the ankle design: Extra padding can effectively prevent the gun-barrel from scratching the ankle. ✔ Premium neoprene：Ankle holster is made from high quality elastic neoprene, The retention strap features a metal snap for a fast and quiet draw in any situation, You will find it very comfortable, and easy for concealed wearing. ✔ After-sales service:100% Satisfaction Guarantee, No questions asked return policy and Lifetime Warranty. This Ankle Holster is still a generic holster that isn’t really suitable for a large amount of movement. This may be a top choice for stationary users with smaller calves and smaller ankles. The sizing is not quite what it seems – fits a much smaller calf than it leads on. 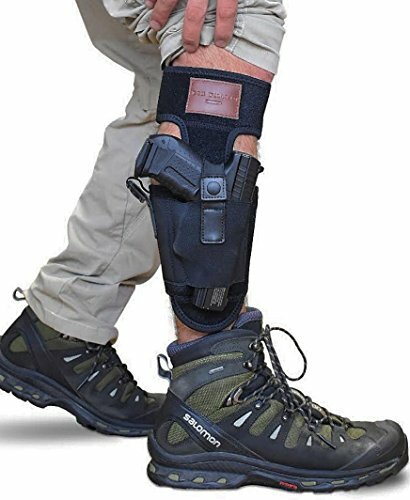 WHY IT IS RECOMMENDED: This Ankle Holster is cheap and for most users with a smaller firearm, this is a great entry into the evaluation phase of an ankle holster. 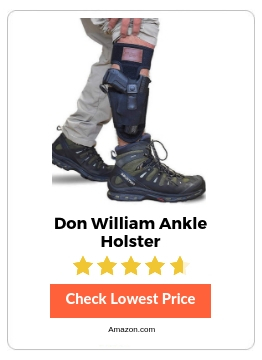 A fantastic warranty makes the Don WIlliam Ankle holster one worth looking into, as many of the generics don’t offer the same perk. 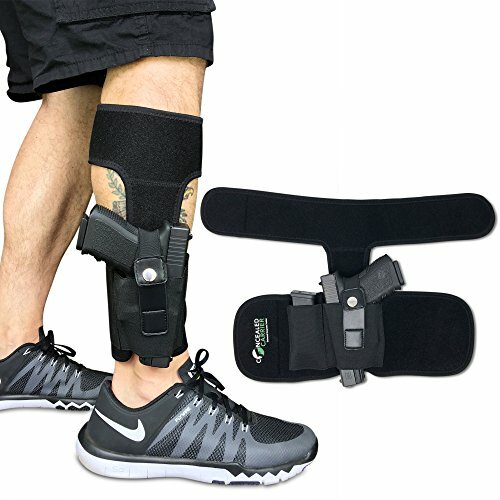 It is a slightly upgraded version of the standard import generic ankle holster. WHY IT IS RECOMMENDED: Still a generic, even though this is a dedicated build for a specific company. The Don WIlliam Ankle holster is better than most generics easily, in most facets of the design and implementation. The AIKATE Ankle Holster is best for those who are firmly in the generic camp and want a good quality version without overspending. This is good for medium and thin calves and ankles (requires at least an 8’ Ankle measurement). WHY IT IS RECOMMENDED: The AIKATE Ankle Holster does what it is supposed to do for a good price with no extras, and that is a good thing from a concealment perspective. ✔ MAXIMUM COMFORT GUARANTEE - Our ankle holster is made out of padded and breathable surgical grade elastic neoprene with air holes that allow ventilation for your legs - you'll forget you have it on! The thick foam innards of the holster will prevent rubbing and discomfort unlike most other ankle holsters you'll find on Amazon! ✔ COMBAT VETERAN OWNED BUSINESS - We are a team of U.S. military veterans using our combat experience with firearms to provide you with the most effective ankle holster on the market. We also provide outstanding customer service! ✔ FITS ALL GUN SIZES. ✔ FITS ALL LEG SIZES. ✔ LEFT OR RIGHT-HANDED CARRY - The universal left or right-handed elastic holster was designed to accommodate any size firearm from a sub-compact Glock 27 all the way up to a full-size .45 1911. The design of the leg straps allow any size calf and ankle to fit comfortable with this holster. ✔ QUICK DRAW GUARANTEE. ✔ NON-SLIP GUARANTEE - Thumb break holster allows you to flick up the retention strap with the back of thumb to draw the firearm quickly and effectively. 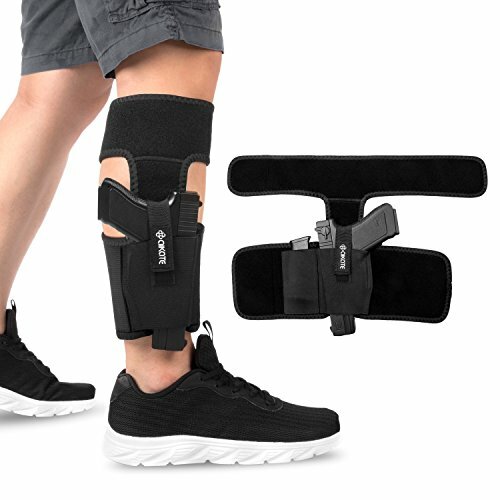 Also, you can walk, jump, work out, and even run with this ankle holster's double strap design without the slightest slip down your leg. Satisfaction Guaranteed! ✔ EXTRA MAGAZINE, KNIFE, OR NON-LETHAL POUCH - We provide you with an extra built-in elastic pouch that can be used for your extra magazine, a folding knife, or even some non-lethal equipment such as pepper spray or a taser. The CONCEALED CARRIER (TM) Ankle Holster is more a universal fit than most ankle holsters on the market. It’s not perfect, but it’s decent for enhanced movement needs, though still probably not the best running holster; except with maybe an ultra-compact gun like a derringer or a tiny automatic. This is significantly better at most tasks than most of the ankle holsters on the universal and on the generic side – this is decidedly not a generic make. The company is responsive, and the quality is above average. The customer service can go a long way to making what is otherwise just a good holster, into something you are ok with wearing often. The Velcro will wear out, this is a material issue, not a brand issue. Be aware of this. 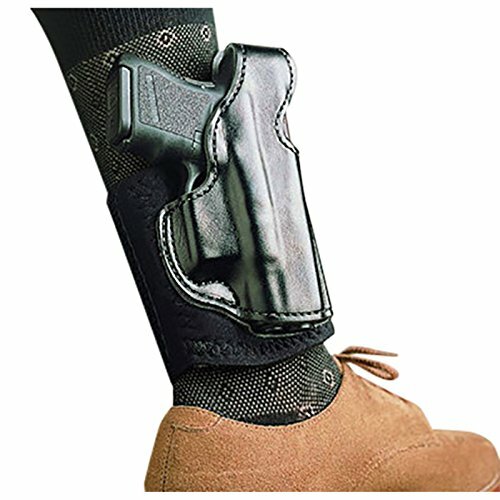 WHY IT IS RECOMMENDED: The CONCEALED CARRIER (TM) Ankle Holster do it better than most universal ankle holsters. That’s enough for most users. 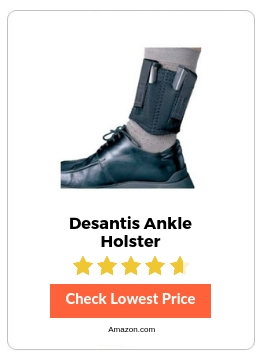 The Desantis Magazines Holster is the best accessory for an ankle holster you can buy if you are dedicated to the concept of carrying on your ankle for legitimate purposes. This is also something you can run with. If you have pulled your firearm, and have a need to run, this can support the bouncing and movement of a brisk run, with just about any legitimate magazine size for ankle work. This is a no-brainer for those who actually know they MUST carry in an ankle rig. An absolutely essential piece for full-time concealed carriers, even those without an ankle holster specific slant. WHY IT IS RECOMMENDED: Don’t leave home without your Desantis Magazines Holster if you have any reasonable potential for using more than a mag load’s worth of ammunition in the course of your daily routine. This type of accessory redefines capability for a space. 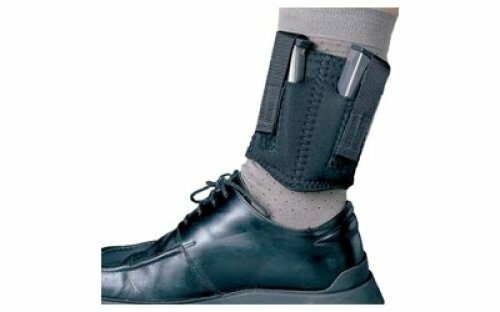 If you can get yourself treated for the whiplash induced by the price tag of the Ankle Glove Holster and can justify the expense, this is a best in class purely ankle situated holster. Despite the great leather gun portion, this is still not a running/heavy movement option and it is still not for bigger guns, regardless of what the marketing department will tell you. Yes, they may make one for the gun (most of the guns they market for are fine to carry 24/7 in this), but that doesn’t mean it’s a top choice for that gun. WHY IT IS RECOMMENDED: Yes, this is a great holster, and it is well suited to the environments that an ankle holster makes sense for, but the high price must be factored in. If you need the best in class and can justify the expense you will be getting a top quality built and a good design set. The excellent protection for your firearm is a great build feature, especially for revolvers where the cylinder can take some abuse as you do move around. 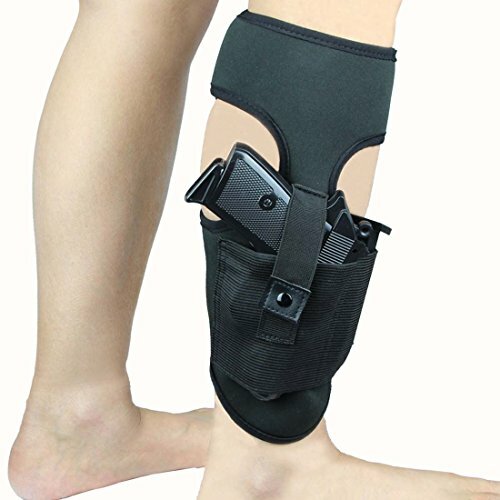 This may be the best ankle holster on the market if you want something to fit one of the guns that they offer this for: the Ruger LCR; the Glock 26 or the Walther PPK (all very good ankle gun choices). This is a genuinely well-built and well-suited holster for those guns. It’s not a universal per se, and it shouldn’t be bought under that premise. The important part of the decision-making process will be how much you need the quality of a holster that will last more than 2 years. This is the choice for those who don’t want to make 3 orders for holsters in 3 years to replace their worn out, underbuilt generic/universal. The Galco is easily the best on the market for the three guns that it is made for, without going to a more custom-built model. 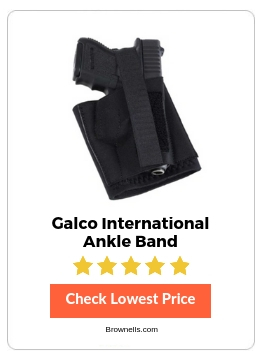 WHY IT IS RECOMMENDED: Simply put: you can’t get a better holster on the ankle for these three guns, even if you have to pay a bit more for it the Galco Ankle Band is worth it. A superior quality build and a great novelty for the industry, but still not the perfect holster for some of the guns it claims to fit. The problem with this Lite holster (and it may be the only problem) is that it’s too ambitious in the marketing, and the bigger guns while they may fit in the holster require even more sedentary behavior to be worth the purchase. Be aware of the gut feeling you have when you question as to whether it will fit a Glock 19 and still be usable (there are other models that it similarly won’t be at peak performance with). WHY IT IS RECOMMENDED: Even if the marketing team is a bit off, and the production of the larger gun models doesn’t make sense, the Lite holster is still a top choice for the smaller guns and is built to last longer than the 1-2 years most of the cheaper holsters will last. The best ankle holster is the one that fits best and doesn’t annoy you while you are carrying. You will definitely need to determine that you are a good candidate for the ankle holster in general though, as that is a more important consideration than actually picking between, what has become a large amount of the same types of designs make by big Chinese contract manufacturers. Please note, we are not against the idea of cheap commodity products, but they must work when it comes to a duty type of accessory like a holster. When you go through the criteria and read the general notes we have included as part of this buying guide article, you will easily be able to find a best in class for your needs and will easily be able to justify the expense even if it is one of the more universal or generic choices you eventually end up with, because each holster will fit a specific use case best. There are many different holsters on the market, lucky for you we’ve reviewed the best 10 holsters available right here.